Video poker gaming initially started in the seventies. The new style of playing poker actually got immense popularity only after 1980, when IGT (a slot machine manufacture company) started manufacturing video gaming consoles for playing poker. There are different beliefs regarding the source of the word “poker”. Most of the historians believe that the word came from a French game called “poque”, widely played in eighteenth-century. The same is explained in most dictionaries. Some references also suggest that it resembles a German game, named “pochspiel”. Another common belief suggests that it may even have been inspired by the Hindi word “pukka”. This is a very popular type of casino gambling offered in land based casinos as well as online casinos. 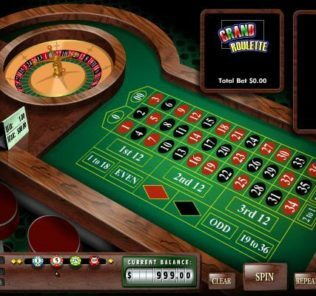 The game is quite similar to slot machines but it also has specific regulations that resemble the poker of five card draw. This type of gaming has become immensely popular in the online casinos. The game of video poker can provide unlimited hours of exciting and heart-racing entertainment. The game requires a lot of skill from the player; however luck plays a significant part too. 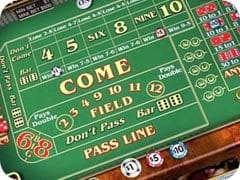 In casino gaming, much is said about the house edge and everybody knows that house always has the higher advantage. However, in video poker the players also have equal advantage. There are some moderate pay tables on which players can get a slight advantage. The game also involves the extra benefits such as free play, cash back and mailers. If you include all such benefits then you can get over 100% returns. Generally, a video poker machine would look similar to a slot machine. These machines offer a variety of denominations including nickels, quarters and most popularly dollars. Some also offer five dollars denominations. Almost all types of games are poker games involving five-card draw. In five-card draw poker games, the player is initially dealt five cards. He can discard any number of cards to improve the hand. After that, new cards are dealt, to replace the discarded cards which then make the final hand. Most of the regular gamblers consider the game of video poker as greatly superior to slot machines. The reason behind this is that it has the ability to offer higher payback for skilled play. 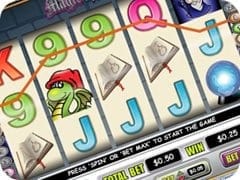 Normally, slot machines are programmed in such a way that they pay back a preset percentage of the money that is offered into the machine. On the other hand, the poker game played on the video interface can get influenced by perfect strategies and this can significantly increase the payback percentage. Also, there are many players who often get nervous or panicky during table poker games or live poker games. 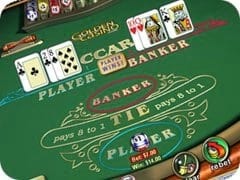 For such people, video games of poker can prove to be friendlier since it offers the advantage of strategic play with the individualistic experience, similar to a slot machine. There are various games available on video poker such as Jacks or Better, Jokers Wild, Deuces Wild etc. There are very simple rules that are followed during video poker games. The player initially bets 1 or more coins to get dealt five virtual cards on the video screen. From the five cards dealt, the player has to choose which cards to hold and which to discard. The strategy should be to generate the best possible poker hand of five cards. The player can also discard all five of his cards. The discarded cards get replaced by drawing again which makes the final hand. This final hand pays out depending upon the payout table of the concerned game. There are certain machines that offer good payback percentage on certain games. The game of Jacks or Better, with the highest payback percentage, can pay back roughly around 99.5% with proper strategic play. In a Deuces Wild game, with a full pay schedule, the machine can pay back over 100% with perfect strategic play. These are ideal conditions of strategic plays, however in reality players tend to make mistakes and these mistakes can reduce their payback percentage by almost 5-7%. 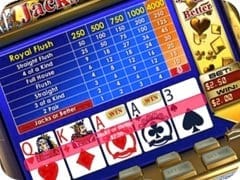 Still, video poker games are considered the most profitable of all casino games. This is also due to the fact that players can play almost 500 hands per hour in video games of poker. For formulating the best strategies, it is important to practice hard. 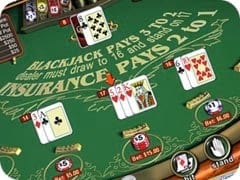 Practicing video games of poker has become extremely convenient as there are large number of online casino sites that offer free video poker games. There is no need to download any software and there are no costs involved. The best part is that these online games follow the same rules and regulations with which the land based poker games are played. As the popularity of video games of poker increases, so is the number of variations of the video poker games. There are some games that involve multiple decks, while some involve the concept of wild cards. Some games offer bonus on getting four cards of same color and so on. Also, there are different payoff tables for different machines. In order to have an edge in the poker game, the player must deploy perfect strategies that are appropriate to his game and the payoff table. The player, who does not do this and just picks up a machine randomly, is not going to be successful in the long term. There are various strategies that are being formed using computer analysis. These strategies, when applied to the video poker games give the player almost 100% accuracy. In order to become successful at poker games, it is very important for the player to choose the machine carefully so that it can give the most generous payoff tables. However, forming successful strategies is not easy; otherwise anybody would be a master at poker games. For becoming a successful poker gamer, it is important to understand the best payoff tables for each and every game and learn to play them carefully. There are different games that are played on video poker. The best of them are Jacks or Better, Jokers Wild and Deuces Wild. The following are some basic strategies that can be used play each of these games. While using these strategies, it is very important for you to first analyze your hand carefully and then select the best option on the machine. There is no need to rush. If you are dealt paying hands then hold all of them. However, if you get four different cards to a royal flush, then you can break up your lesser paying hand. Keep holding any four cards for a straight flush, any three cards for a royal flush, any three cards for a straight flush or any four cards for a flush. Keep holding any two low cards that form a pair, any four cards making successive straight and two high cards from the same suite. Keep holding any single high value card of two high value cards of different suites. The joker is a very important card in this game and if your dealt hand contains joker then you need to keep all the cards that are three of a kind or even higher. Here, the joker is a part of the winning hand you would be aiming for. So, for a three of a kind combination, you can have two eights and the joker. Keep holding three cards for a royal flush, any four cards for a straight flush or any three cards for a straight flush. Keep holding high cards pair such as king, joker or ace, joker. Keep holding consecutive four cards for straights. Keep holding four cards for any flush, three cards for a straight flush and four cards for a successive flush. If one of the cards is ace or a king then keep holding two cards for a royal flush. Keep holding any four cards for straight flush or any three cards for a royal flush or four cards for a royal flush. Keep successive cards for four card straight or three cards for a straight flush. If your dealt hand does not contain any of the above combinations, then in order to create the maximum paying hand, discard all five cards and draw a new hand. Also, do not hold three cards of the same suite unless they offer a potential straight flush. Above all, for playing video poker, try and play the maximum coins, for higher bets and in turn, higher winning payoffs. Almost all machines offer bonus on the highest hand if five coins are played. If you are just starting with poker and find it difficult to play high bets then you can start with lower coin bets.